with another favourite – Ray Bourque. There have been some lopsided trades in the history of the National Hockey League. Ranking right up there has to be one, engineered by my beloved Boston Bruins in 1986, where they sent Barry Pederson to the Vancouver Canucks for Cam Neely and a draft pick, that would turn out to be Glen Wesley. Neely would go on to a hall-of-fame career in Boston, and then into the front office where he would finally have the chance to hoist the Stanley Cup as the Bruins’ president in 2011. Wesley would be on two Bruin teams that made the Stanley Cup finals, before signing as a free agent with the Hartford Whalers where, as the Carolina Hurricanes, the Whalers would make the finals two more times and win the Stanley Cup in 2006. It was the compensation for the Wesley signing, three draft picks from the Whalers, that gave Boston the gift that keeps on giving, as they still had players directly linked to that trade right through the 2014-2015 season. 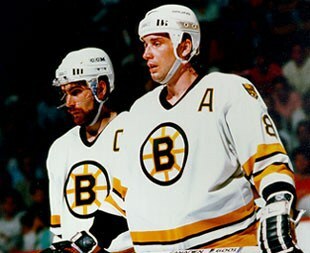 Cam Neely is my favourite Bruin of all time. He was the consummate power forward even before that term existed. He was big, tough, and could put the puck in the net with a great set of hands. He was left-handed so, when he had to fight, he always seemed to get in the first shot. But it was that grit and leadership that made Cam the best. Neely found his scoring touch in Boston. His first season with the Bruins was 1986-1987, and he scored 36 goals and 36 assists for 72 points. The previous year he had recorded 14 goals and 20 assists for 34 points. The best was yet to come for the rugged right winger from Comox, who played his junior in Portland with the Winter Hawks. In his second season with the Bruins, his numbers kept improving, as he scored 42 goals, and added 27 assists for 69 points. His point total increased again the next season, 1988-1989, to 75 points. He had fewer goals with 37 but more assists with 38. The 1989-1990 would be a major breakthrough for Cam Neely. He broke the 50-goal mark with 55 goals. He added 37 assists for 92 points, a career high. The Bruins also advanced all the way to the Stanley Cup finals for the second time in three years, losing to the Edmonton Oilers for the second time in that same stretch. The next year would be full of highs and lows. Neely again surpassed 50 goals with 51 in the 1990-1991 season, and added 40 assists, giving him 91 points, one short of his career high. Neely, along with Phil Esposito became only the second Bruin, to have back-to-back 50-goal seasons. The Bruins advanced all the way to the Stanley Cup semi-finals against Pittsburgh, and even took a 2-0 lead to start the series. In those 1991 playoffs, Neely suffered an injury after a questionable, some would even say dirty, hit by Ulf Samuelsson. His condition, from that hit and others, worsened as the muscle began to calcify. It was literally turning to bone. Doctors would remove a chunk of calcified muscle the size of a grapefruit from his leg, and his return was questionable. It appeared Neely’s production would never be the same. He missed almost all of the next two seasons. In the 1991-1992 season. He only recorded nine goals and three assists in nine games. The next season, 1992-1993, was not much better, as he again was hampered by those recurring injuries, playing in just 13 games, where he scored 11 goals and assisted on seven others. That grit and perseverance was evident when Cam Neely did return to the line-up for the 1993-1994 season. Turning heads across the league, Neely went on a goal-scoring tear. He would only play in 49 games that season, but scored an incredible 50 goals in his 44th game, and recorded 24 assists. Only Wayne Gretzky scored 50 goals in a season in fewer games. However, the distinction of scoring 50 goals in 50 games eluded him. Because of his leg, it was not consecutive games because he had to sit out and rest. No matter, that season was remarkable because it showed more than just goal-scoring prowess, it showed character – and that’s what Cam Neely was all about. For his efforts, Neely won the Bill Masterton Memorial Trophy for exemplifying the qualities of perseverance, sportsmanship and dedication to hockey after the 1993-1994 season. He would play the following two seasons then retire. In 1994-1995, he recorded 27 goals and 14 assists for 41 points in 42 games, and in 1995-1996 he recorded 26 goals and 20 assists for 46 points in 49 games. It says a lot of the expectations of Neely that many consider these two 20-plus goal seasons a failure, when any 20-goal season is a success for most players. What I will always remember about Cam Neely though, was waiting for his next meeting with Ulf Samuelsson. It did not come for some time, because Ulf mysteriously sat out with injuries the next couple times Boston played Pittsburgh. Then, when he could run no longer, they met. It was all over Sportsdesk on TSN. Samuelsson punched Neely in the back of the head. Neely grabbed Ulf, and dropped his gloves. Before he could do anything else, the big Swede turtled. Neely punched wildly at his shoulders. Then, out of complete frustration grabbed Ulf and tried to get at him. It would not have hurt anyway, because Ulf was turtling. It showed to me the frustration Neely had pent up for years, that he was still unable to get out. I think his best revenge was still scoring 50 goals in 49 games, and going into the Hockey Hall of Fame in 2005. He also had his number eight retired by the Bruins. The Neely trade always strikes a sour chord for Vancouver Canucks because of everything that transpired. The one thing they never had to endure was the agony of his slow decline, resulting from events beyond his control in so many ways. Yet, I know I will be eternally grateful for the Canucks for sending us Cam Neely. It wasn’t because he was “The gift that kept on giving.” That was just an added bonus. Instead it was because Neely became he heart and soul of the Bruins and their avowed leader. He was so tough, gritty, determined, and skilled. Much was made of his election to the Hockey Hall of Fame. There were those who said he did not play long enough, put up good enough numbers, or win any Stanley Cups. His election was based purely on emotion. There is nothing more central to the game of hockey than emotion. There are so many intangible qualities that cannot be distilled into statistics: courage, leadership, determination, heart, character. If Neely was elected based on that, then he’s deserving in my book because the hall of fame should be representative of all aspects of hockey. The last great memory I have of Cam Neely is just a four short years ago. A couple years before that, a buddy of mine phoned to let me know he found a website to order sports jerseys from. He wondered if I wanted anything. I went on line and staring me in the face was Cam Neely’s No. 8 black road jersey from the 1980s. I ordered it instantly. That jersey got worn out during the 2011 playoffs. I went down to this local pub to watch every game I could of the Bruins’ playoff run, and I have two outstanding memories. One, in the semi-finals against Tampa Bay, this Lightning fan came out of the washroom and saw me sitting there in my jersey. He accused me of being a bandwagon jumper. “Look at the back,” I growled. He did then, with a look part of drunkenness and part puzzlement, he wobbled slightly as he looked me in the eye. I couldn’t help but smile. This guy was way too young to ever have seen Cam as a player, much less in his prime. The other memory was during the finals against Vancouver. This time, an old buddy came out of the washroom (did I mention I sat near the bathrooms?). He has been a diehard Canucks fan his whole life. He frowned when he saw my jersey. Before he could say anything, I told him to look at the back. “I’ve never liked the Bruins, but I have always loved your guy,” he said. Not a single mention of the fact his team traded him to mine. Instead, the deep respect hockey fans had for Cam Neely. I had a tear in my eye a few days after that encounter when Cam Neely finally hoisted the Stanley Cup – even if he was “just” the president. Fittingly, he shared the ice with Milan Lucic, Nathan Horton and Gregory Campbell, three players whose acquisition can be traced back to the Neely trade. For me it marked the fitting and logical conclusion for a man who gave everything he had for almost 30 years to the Bruins. Where so many players, coaches, and executives leave teams in pursuit of a championship, Neely stuck with the same team. His presence there for the past 30 years, now that’s the real gift.